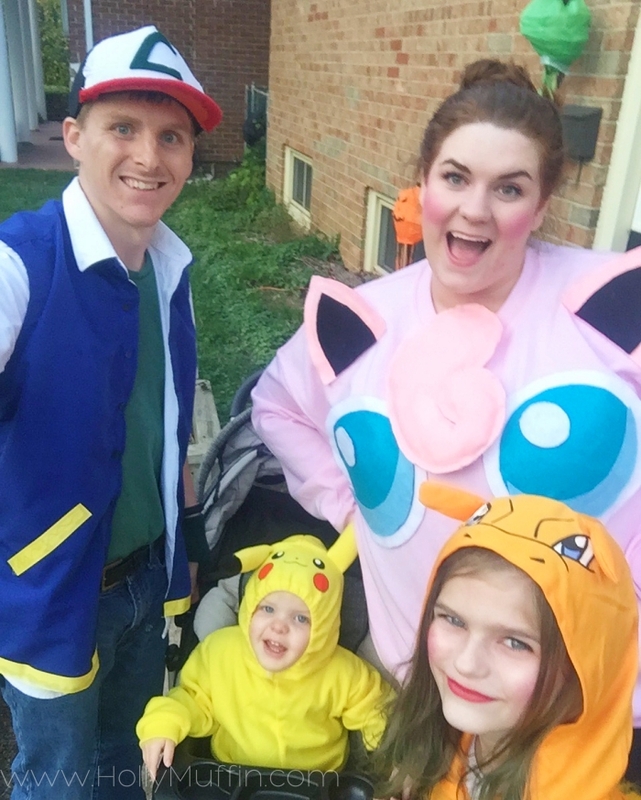 Last year, my entire family was obsessed with Pokemon Go, so when Halloween rolled around it was no surprise that they wanted to be Pokemon. 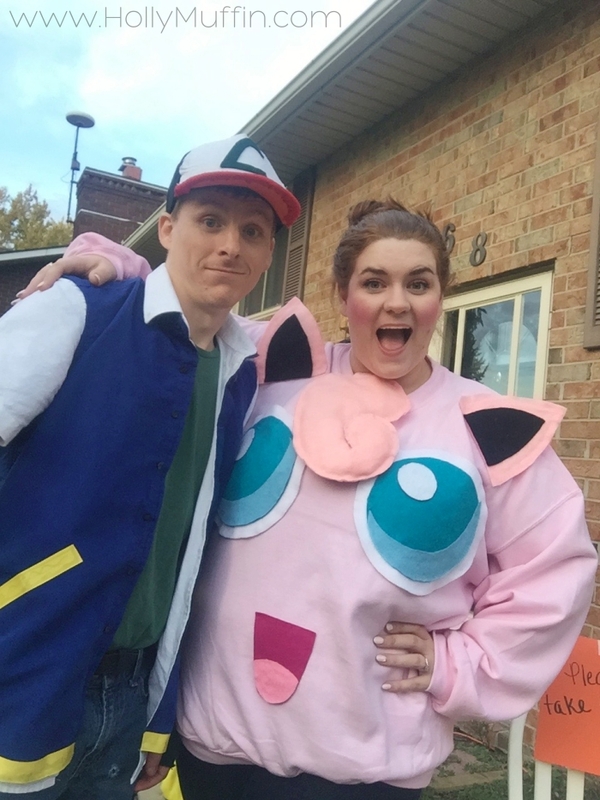 It was easy to find costumes for the kids (scroll down for links), and simple enough to make an Ash costume for my husband, but I had a little more trouble trying to come up with a good costume for myself. 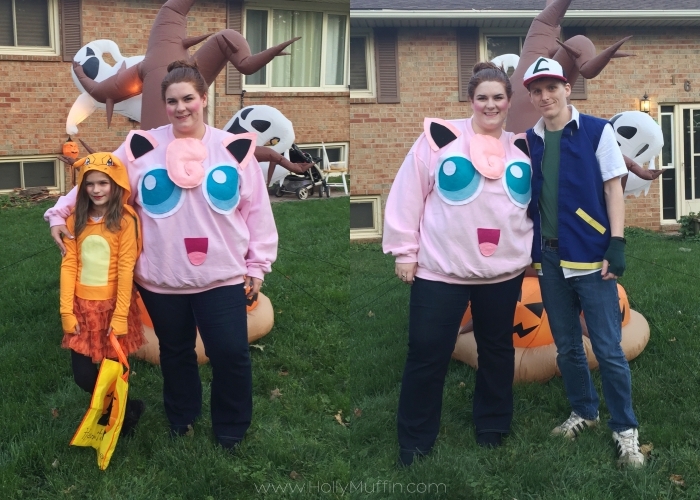 Obviously pink is my favourite colour, so Jigglypuff was the winner – she’s just so cute and round! 2. Craft felt in various colours – I purchased mine from Dollar Tree, but you can find it pretty much anywhere! 3. Fabric glue – I purchased this at Dollar Tree as well, but again, it’s available at most big box/craft stores. 4. Pillow Fill or other stuffing – The truth is, I used old old towels and rolled them up, but pillow filing would be much easier. 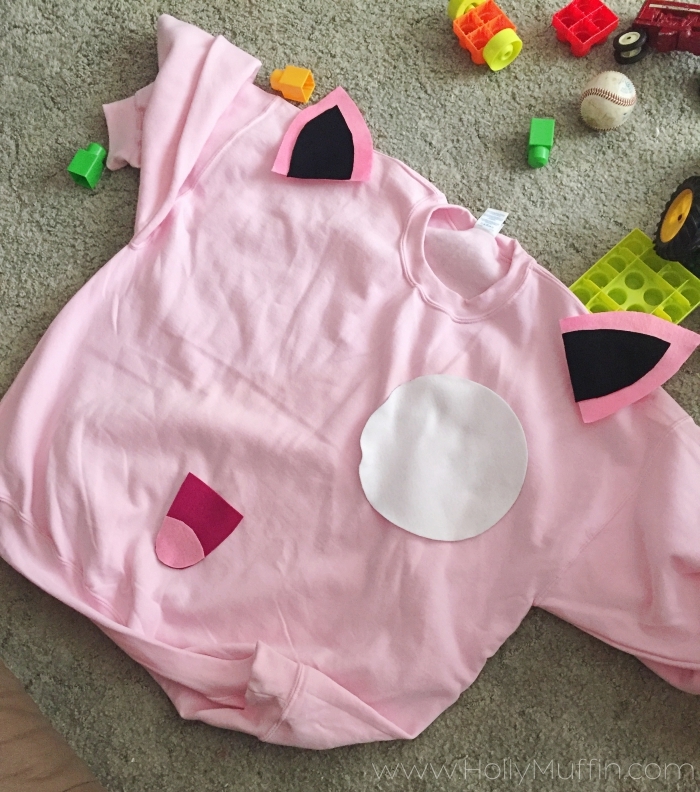 Step 1: As pictured above, I started by laying my sweatshirt flat on the floor and cutting pieces of felt to match what I saw on Google images. There was a lot of guess-and-check involved in this process, but after I got the placement right, I glued down the mouth and eyes. Step 2: The ears were a little different. After the eyes and mouth were secure, I put the sweatshirt on. I played around with pinning the ears to my shoulders, making sure they stood up. When I found the correct spot, I safety pinned the ears on, slipped the sweater off, and glued them down. Step 3: The hair was a challenge. It took some effort to figure out how this would work, but I did it by creating a whole separate, removable piece. I cut two pieces of felt in the shape of the curl (front and back), but made sure to oversize them. I then glued all away around the edge, leaving a small hole for stuffing. I let the glue dry overnight, stuffed it full of old washcloths (get creative – anything will work! ), and glued the opening shut. In the end, it looked like a little pink pillow. Step 4: To finish off the costume, I slipped the sweatshirt on and safety pinned the hair pillow to my chest. Again, getting the positioning right took a bit of time, but it worked out great. I tossed my hair in a bun and threw on some over-the-top pink makeup to complete the look. Step 5 (optional): This sweatshirt sat perfectly on me, but if you’re on the smaller side, you could easily stuff the inside of the sweater to make the costume look more rounded. In the end, this costume took me 2 days to make and cost around $30. Along with making my costume, I made Chris’ Ash costume using thrift store finds, ribbon, and fabric glue. I used a regular old baseball hat and covered it in felt to complete the look. You can purchase an Ash Ketchum costume, but making one only cost me around $10. I purchased CJ’s toddler Pokemon Pikachu costume here (also available here). I purchased Holly’s girl’s Pokemon Charizard costume here (also available here). 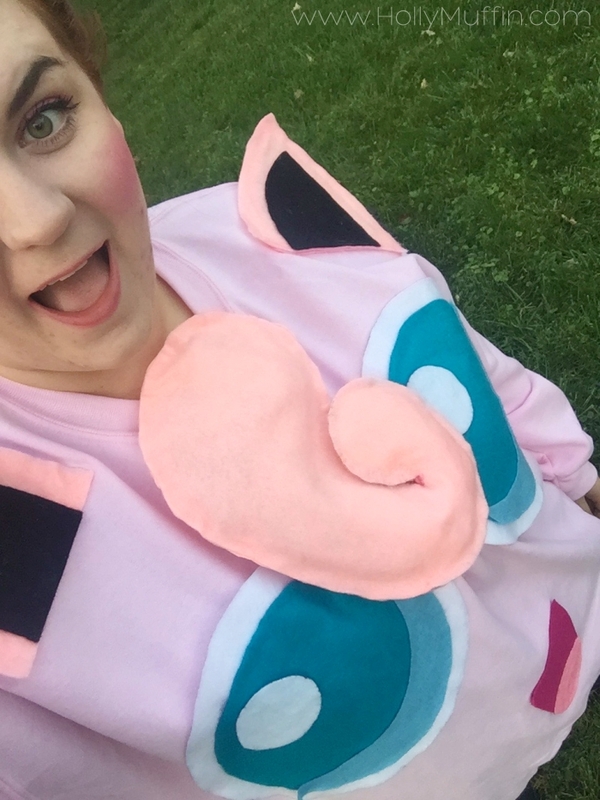 This costume was such an easy DIY, but it got me so many compliments!